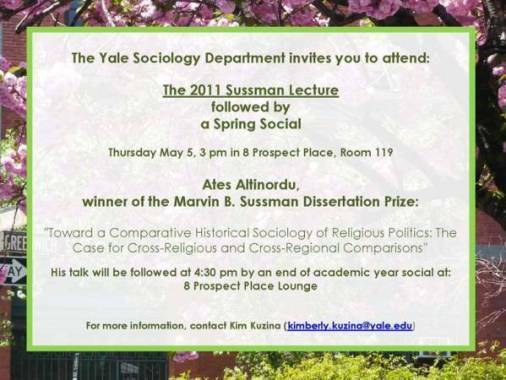 Ates Altınordu, faculty member in the Faculty of Arts and Social Sciences, has been awarded the Marvin B. Sussman Dissertation Prize for his outstanding 2010 thesis, "The Rise and Transformation of Religious Politics: Political Catholicism and Political Islam in Comparative Perspective." The prize, created in 1993, was endowed by Marvin B. Sussman (Ph.D. 1951, Yale). It is offered annually to the former Yale Sociology graduate student whose dissertation, completed within the previous two academic years, is judged the most outstanding. Altınordu will return to New Haven on May 5 to give a lecture to the department.